More info:Plus local payment from USD 650. 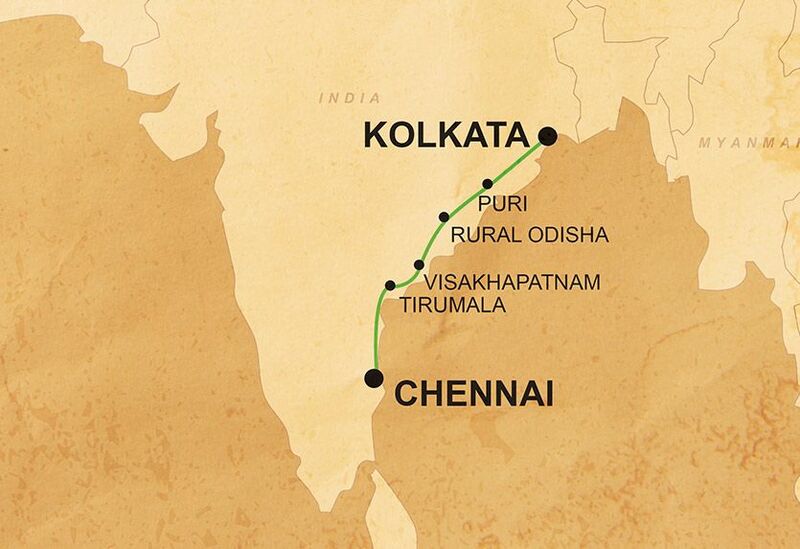 On this epic trip through India, we will be travelling overland, using a combination of overland vehicles, boats, tuk-tuks, and trains thus cutting out the need for air travel and reducing carbon-emissions. Going overland (by car and on foot for excursions) also means you get to explore places which are off the beaten track. We have a strict set of rules regarding wildlife-spotting, for example when in Chitwan National Park. In order to minimise the impact of our presence on the wildlife and ecosystem of the areas where we travel, we explicitly forbid any involvement in activities that harm or exploit animals, and advise our crew in specific activities to avoid in this regard. Wherever we are in the world, we prefer to use smaller locally-owned businesses, ensuring that local communities gain a direct economic benefit from our business, for example, we use small locally owned hotels, campsites and activity providers wherever possible. For example, in Muniguda we stay at a guesthouse run by the New Hope Charitable Trust, an NGO helping to uplift the poor and disadvantaged, and support and visit their project and the people that they assist. We use local guides and operators throughout the trip; for example, in the Odisha Tribal Region of India we use a responsible local operator that provides training and employment to many local people as guides, providing them with stable employment in the tourism industry. We also feel it is important that our guests immerse themselves in the culture of their host country and we ensure that we weave experiences that will facilitate this into our itineraries. For example, we visit local markets in the Odisha Region and throughout the route. We are also involved with a variety of community projects in key destinations as we visit. Our involvement with these projects is a long-term commitment, allowing us and our passengers to participate directly in delivering real practical benefits to the communities we travel through on the ground. The projects are not tourist initiatives, but a way of employing tourism to generate funding and support and facilitate community interaction. For example, in Puri or Kolkata we have the opportunity to visit and support the Ushti Foundation, who support underprivileged children and young people through schooling and professional training, so that they can lead self-determined, financially independent lives.